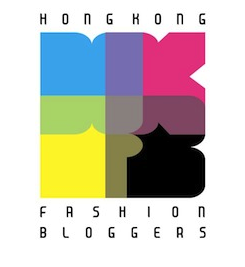 ← FACESSS beauty experiences – a Clarins facial, NARS makeover & Amika hairdo all under one roof! 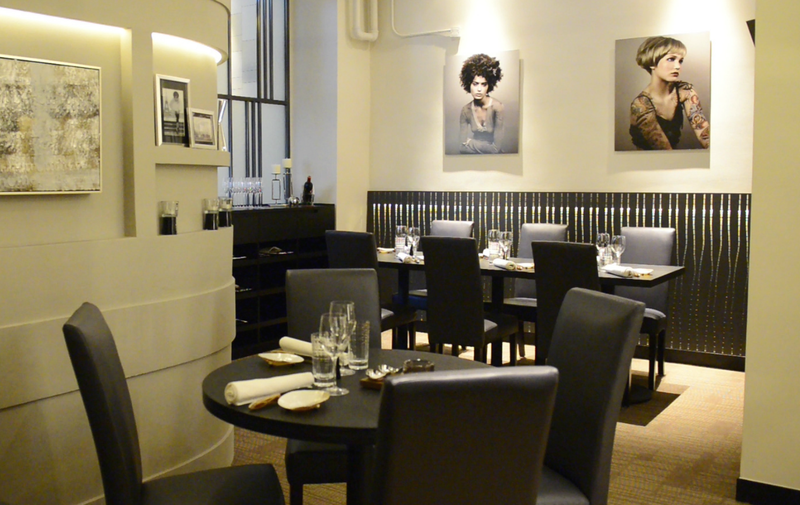 Akrame restaurant review – modern Michelin-starred dining ahoy! When did Ship become so hip? Back when I worked near Ship Street in Wan Chai many moons ago, the greatest culinary achievement it had to offer was a Sloppy Giuseppe at Pizza Express. And as much as I love me some garlic doughballs, they probably won’t be winning a Michelin star anytime soon! Now, thanks to renowned British chef Jason Atherton moving into the ‘hood with 22 Ships, the area has become a veritable foodie mecca – and one of the newest places for gastro-pilgrimage is Restaurant Akrame. 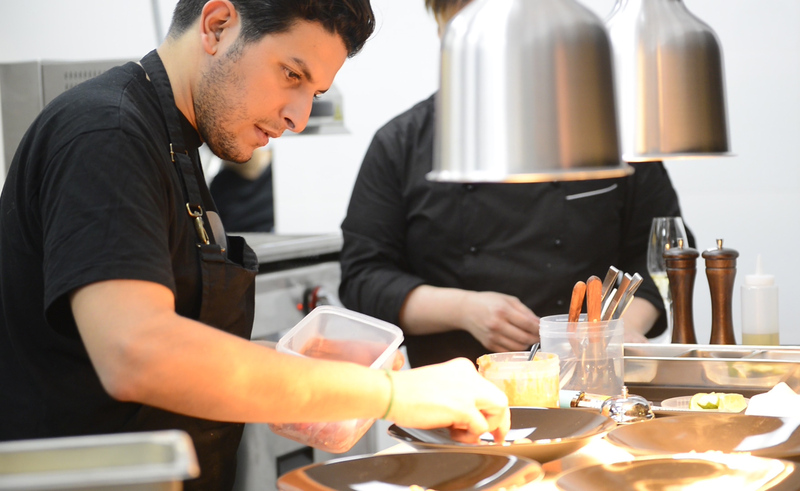 Yep, for his first restaurant outside Akrame’s famed flagship in Paris, Chef Akrame Benallal chose not London, not New York, but our very own Hong Kong… and to be more exact, Number 9 Ship Street in little ole’ Wan Chai. Not bad for a road that used to have Shake ‘Em Buns on it, eh?! 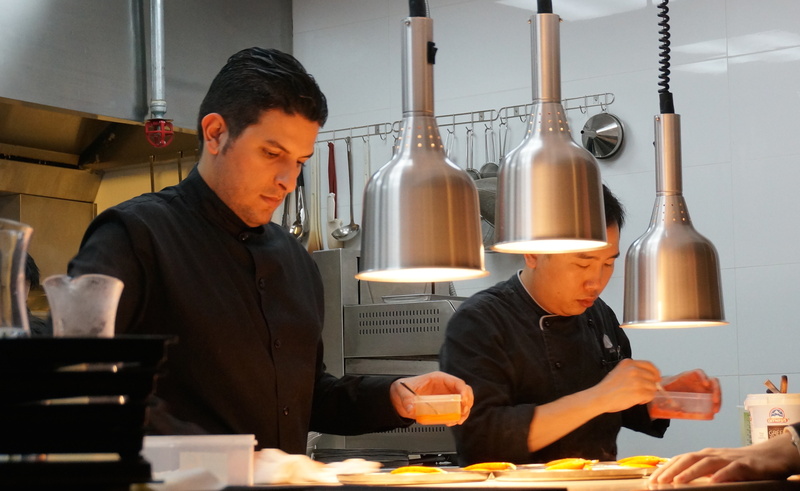 Fresh from becoming one of the youngest chefs in the world to win a second Michelin star at the Paris restaurant, Chef Akrame was in town to celebrate with a special eight-course Two-Star Michelin Chef’s Menu at his Hong Kong branch – and I was lucky enough to be invited to try it… cooked by the man himself! Unlike the fancy grandeur of many high-end restaurants in Hong Kong, Akrame’s interior is sleek, minimalist and monochrome. The walls are concrete, the furniture black, the kitchen open and the paintings unframed. I’d say the atmosphere practically screams contemporary yet sophisticated fine dining… except I can’t imagine anyone in Akrame ever screaming anything. Softly whisper in a French accent, perhaps? 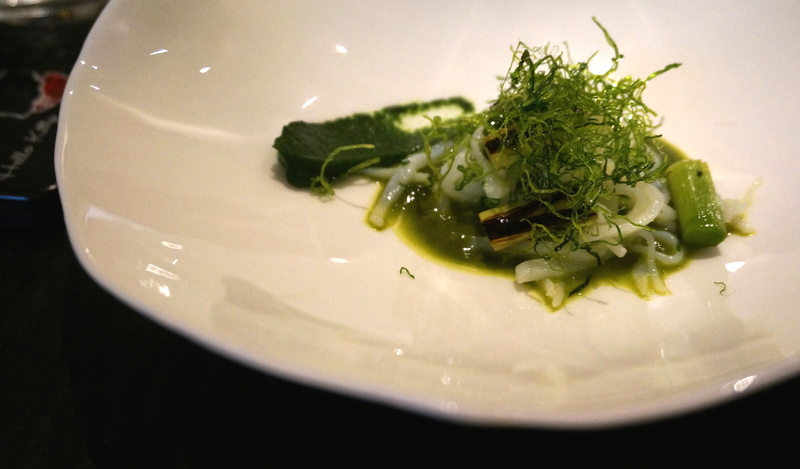 Owing to time constraints, I only managed about five of the eight courses (although once you factor in all the amuse-bouche, palate cleansers and little surprises, you’re probably closer to a dozen!) 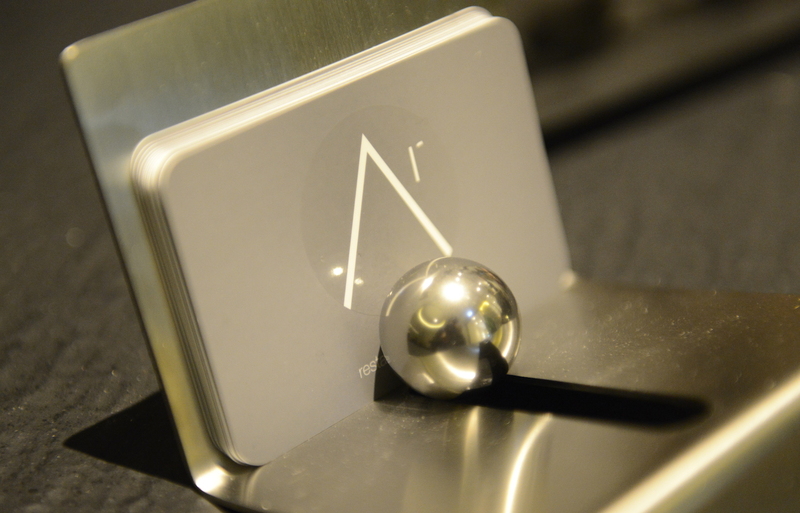 – so ensure you leave at least three hours to fully enjoy your Akrame culinary experience! 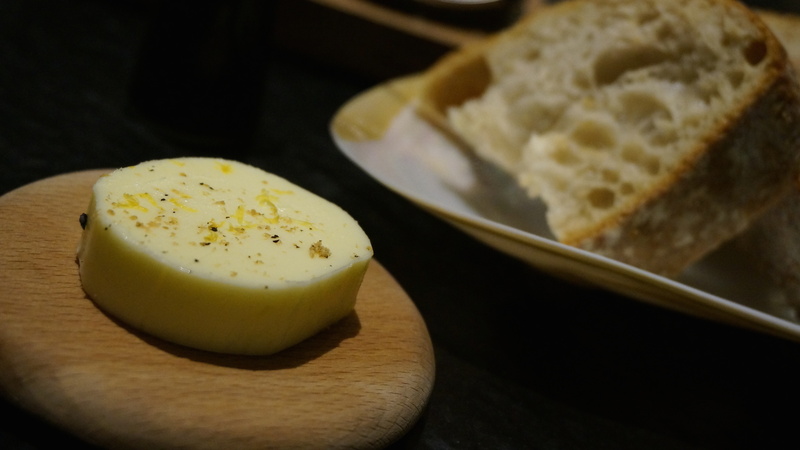 For a sign of things to come, you only need see the butter that comes with the bread for your meal – it’s infused with lemon (which I really enjoyed). Chef Akrame’s dishes take several surprising twists, with bold and eclectic flavour and texture combinations the order of the day. Some work, some don’t… but all are interesting! 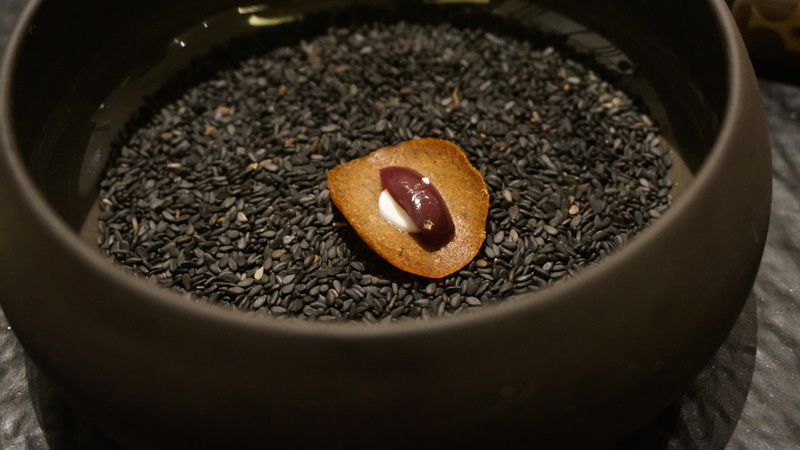 First up was an array of immaculately presented amuse-bouche – an olive chip with Greek yoghurt, a squid ink crisp with smoked eel, cheese crumble with salmon roe and lime, and celery with anchovy. For tiny wee morsels, these all packed one hell of a punch flavour-wish; I normally love anchovy yet this proved a little strong even for me! Our “vegetable” was carrot with grapefruit (not sure if this is big enough to constitute one of your five-a-day though!). 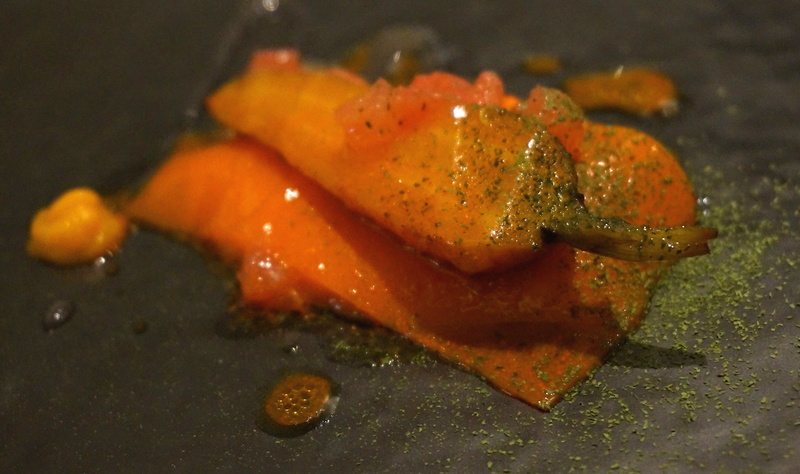 The combination of different textures – in addition to the baby carrot itself, there was also a purée, gelée and powder – was interesting, whilst the main sweet flavour was a welcome contrast to the pungent amuse-bouche before it. Portion sizes started to grow bigger with the sautéed cuttlefish with leek soup and watercress purée; I could sense my Spidey senses for all things gluttonous tingling and sure enough, there were some delicious deep-fried leeks lurking in there too! Despite the fact it looked like something that had come out of Ursula’s lair in the The Little Mermaid, I enjoyed the light and clean taste of this dish. 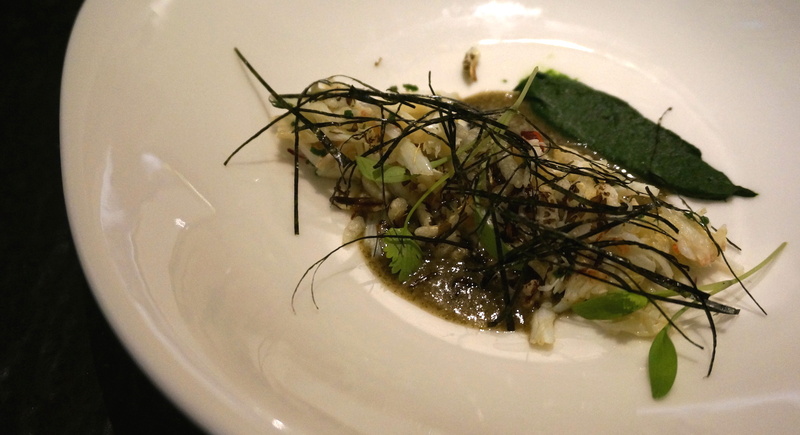 One of my favourite dishes of the day was the crabmeat with crisp rice puffs, spinach purée and seaweed. 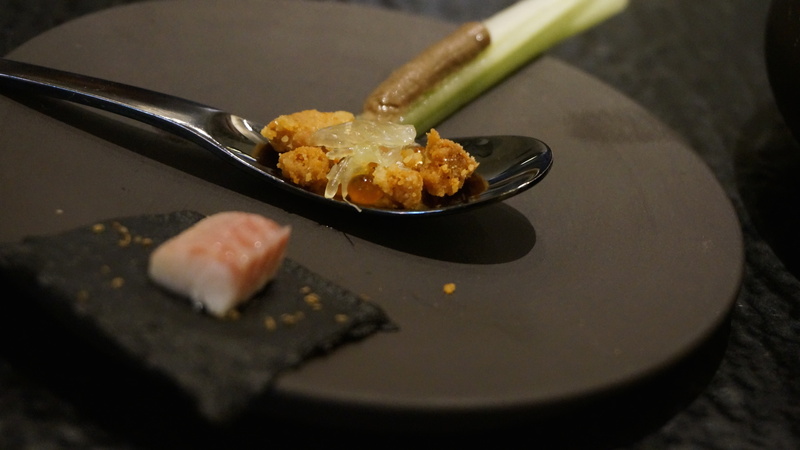 I loved the play on textures between the soft tender crabmeat and the crunchy rice crispies, whilst the black olive vinegar sauce was the best kind of umami hit. However, my absolute highlight of the meal was a dish I received simply because I opted out of the oyster course. I profusely thanked the foodie gods for the fact I’m blessed with such a cheap date palate, as a dish featuring two of my all-time favourite ingredients was presented before me – sliced mushrooms, mushroom purée and a slow-cooked egg. Short of finding a way to work bacon or chocolate in there, I couldn’t have been more excited! Gooey golden yolk, earthy slippery mushrooms, a bracingly salty purée and some of the most finely-ground breadcrumbs in history combined to create what was one of the most simple, but downright delicious, dishes on the menu. Again, the use of different textures was thoughtful and intriguing, whilst the flavours galloped into sensational territory; if I had been in less polite company, I really would have licked the plate clean (I settled for mopping up the remains with my bread instead!). After that, the pan-fried scampi with asparagus just felt a little ordinary. Again, I liked the light fresh flavours here, but what with the earlier dishes, was starting to tire of the all-green colour scheme! 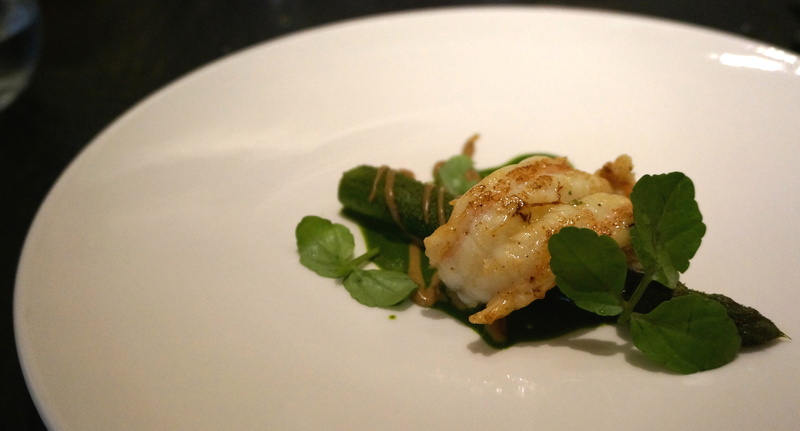 The next dish was anything but ordinary, providing a neat dose of the wow-factor given the $1k+ per head cost. 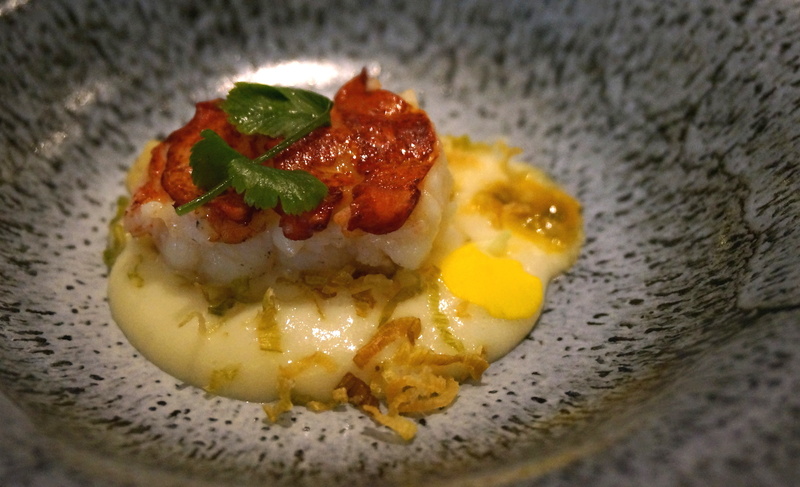 The poached lobster is cooked at your table in a jar filled with lobster consommé (which also comes served separately in a little cup for you to sip later), then dished up by your waiter onto a bed of mashed potato and passionfruit sauce. Having eaten a lot of bleh lobster at cheap Chinese restaurants recently, tucking into this perfectly cooked, blissfully sweet chunk of meat was a grin-inducing moment! However, whilst I thought the unexpected citrusy zing of the passionfruit worked quite well with the lobster, I wasn’t convinced that it worked with the mash. One of my far wiser eating companions (Peter of Diary Of A Growing Boy) reckoned this was because the milk in the mash clashed with the acidity of the fruit… and I think he’s probably right. The final main I got to grab a bite of (the clock was ticking so it really was just a bite… alas, I missed out on the duck entirely) was cod with amaranth seeds, Kamut khorasan wheat, and squid ink and olive sauce. 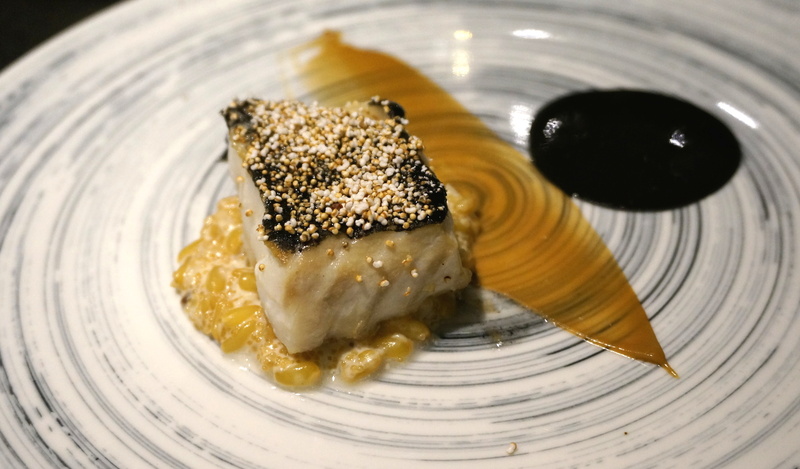 The cod was cooked beautifully and paired well with the creamy, nutty, chunky mixture of grains beneath it – another unexpected but inspired combination. Because I am a dessert fiend, Chef Akrame kindly sent out my sweets early; fellow dessert fiends will be pleased to hear you get not one, not two, but three desserts for your delectation here. 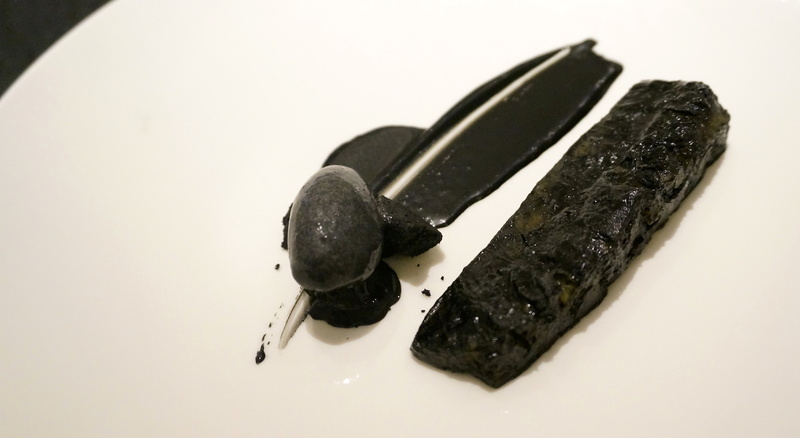 My least favourite was the charcoal pineapple with charcoal ice-cream. Now we all know we eat with our eyes… and frankly, I found this positively unattractive. It looked like an oil spill had polluted my favourite course! Taste-wise, I couldn’t make out anything different about the pineapple than normal; meanwhile, the ice-cream had a not unpleasant smoky taste, with chunks of something crunchy within. It was probably something nice like biscuit, but my brain had already decided it was charcoal chips from a barbeque and I just couldn’t deal. Thankfully, I was a much bigger fan of the other two desserts – including, surprisingly, the coffee crème brûlée. I normally loathe the taste of coffee… so I would never have predicted that this was another dish I’d be practically licking clean. 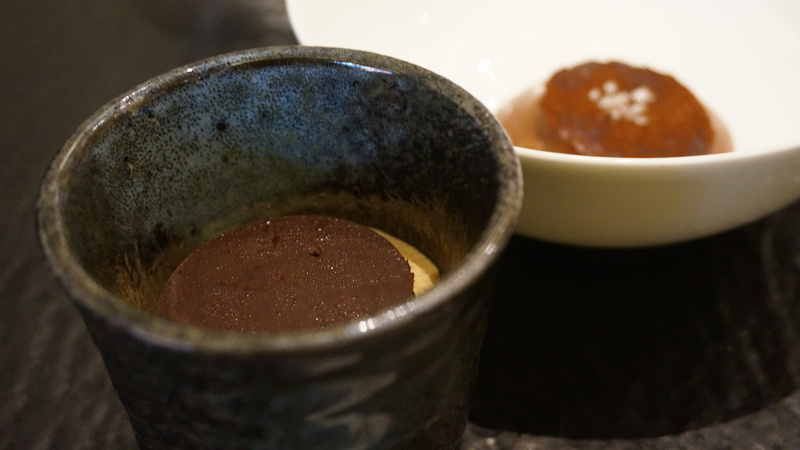 The custard was so light I’d finished it before I’d realised (sob), whilst the pleasingly thick chunk of dark chocolate on top and the moreish hint of caramel made this little dessert pot a thoroughly grown-up but wholly delightful affair. The chocolate mousse was a little more standard if no less delicious. 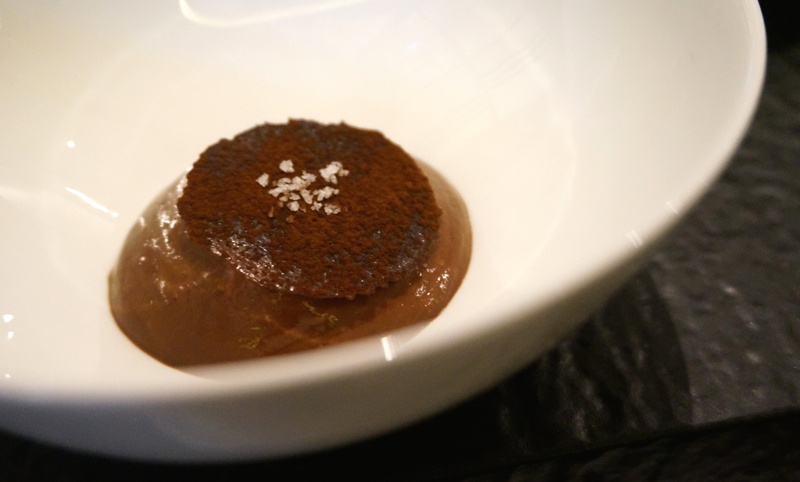 The paper-thin wafer on top could have done with being a bit bigger to provide a texture contrast for all (as opposed to one bite) of the mousse, which was sinfully, gloatingly rich with a tingling sprinkle of sea salt that cut through it neatly. Akrame’s special eight-course Two-Star Michelin Chef’s menu costs $1,398 and is available until the end of April; their regular four-course menu is priced at $788, the six-course $998, and an eight-course dinner menu is available for $1,988 – and the dishes change up every two weeks, guaranteeing a different experience each time. Clearly, at those prices, Akrame is a treat-yourself, special-occasion kind of joint – although given the number of other bits and bobs you get for your buck, I actually think it’s not bad value at all. For me, the most obvious points of comparison in Hong Kong are Amber (which I loved) and Pierre (which I didn’t) – except with its hunky young chef, industrial-style décor and intriguing presentation, Akrame has a different, almost edgy cool factor. 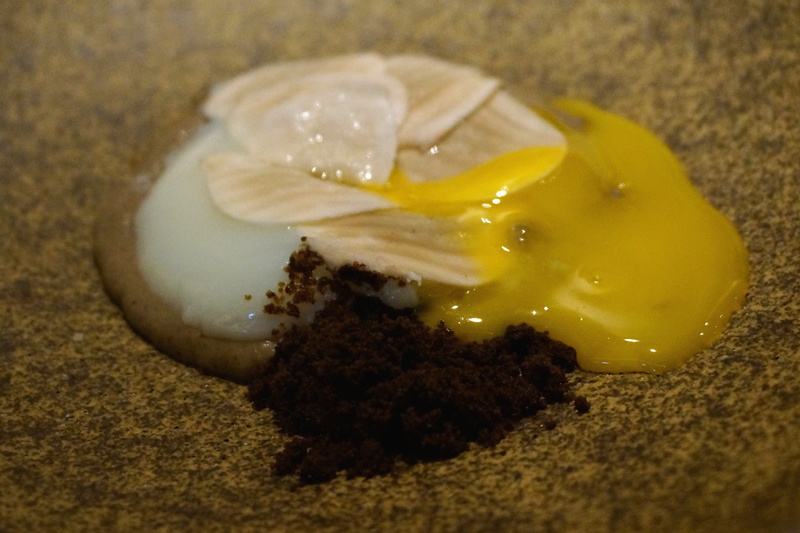 With interesting and innovative techniques, ingredients, textures and flavours, this was food I admired rather than passionately fell in love with… but Akrame is definitely an exciting addition to the Hong Kong restaurant scene. If you love contemporary fine dining or have foodie friends you wish to impress, then it’s time to set sail to Ship Street – first stop, number 9! This entry was posted in Food, Hong Kong and tagged Akrame, Akrame Benallal, Akrame Hong Kong, best restaurants in Hong Kong, best restaurants in Wan Chai, fine dining Hong Kong, fine dining Wan Chai, French cuisine Hong Kong, French cuisine Wan Chai, Michelin-starred dining Hong Kong, Michelin-starred restaurants Hong Kong, Restaurant Akrame Hong Kong, review, Ship Street, Ship Street Hong Kong, where to eat in Wan Chai, where to eat on Ship Street. Bookmark the permalink.